Summer is officially here, which means that for us nerdy folk, it’s time to attend our local Renaissance Faire! Huzzah! If you have never been to one before, here’s my advice: you have to go at least once in your life. Seriously, it’s so much fun. I’ve been attending my local Ren Faire for about 4 or 5 years now, and every year I have an absolute blast. If you follow me on Instagram, then you’ve more than likely seen the progress I’ve made on my first original costume for this year’s Ren Faire, which is ooky spooky! While I am certainly no expert on costuming or historical garments, I did spend QUITE a bit of time researching Renaissance costume guides so I can try to seem as authentic as possible (emphasis on “TRY”). And while there is a huge swath of resources out on the internet and beyond, they are often lengthy, supremely information rich, and hard for pinpointing specific terms and getting questions answered. To (hopefully) help out those of you who wish to attend Ren Faire in proper attire, this guide is definitely for you! This is only a super basic guide. I’ve broken down many parts into small, digestible chunks. Review of basic costume pieces for both women and men, and offer some resources that I have found particularly useful (at the end). Summary of accessories, acceptable materials for costumes, acceptable colors, and shoes. I am not covering fantasy costumes. I will talk briefly about that in my Renaissance Witch costume project notes. Now, without further ado, here is my Renaissance Costume Guide for Beginners! The Fete at Bermondsey by Joris Hoefnagel (1569), depicting Middle Class fashion. 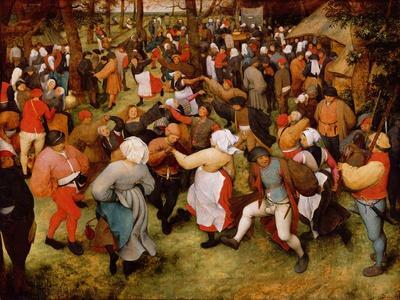 The Wedding Dance by Pieter Bruegel (1566), depicting Lower Class fashion. So not everyone was dressed like Queen Elizabeth, yes, but this gives us so much material to work with as far as creating a costume/character for Ren Faire. With that being said, let’s get on to the basics. From lower class to the wealthy, there is a basic “formula” to how Renaissance Era dwellers dressed. With this formula, we can easily craft an ensemble that’s appropriate for Ren Faire, unique, and comfortable (most importantly). Please note: this is a huge generalization of the rich fashion that was present during the Renaissance era. Before deciding on your own costume, please do your research as to the specific items you would like to incorporate into your look. Depending on the social standing you would like to portray (Lower, Middle, or Upper Class), you may need to add or take away certain elements. What I am presenting is meant to get you going on an easy path to determining what you could wear, and how to wear it. You certainly don’t have to wear every layer mentioned, but I’m throwing it out there for reference. Chemise image from me. Other images used for educational purposes. The major difference between these two configurations is the choice to wear a separate bodice and overskirt, or a gown (wherein the bodice and skirt are attached). From what I’ve seen, gowns are a bit more lavish, while bodices and skirts allowed for a bit more variety. You also have the option to wear a bumroll along with the farthingale for added effect, or alone without it. *Trouser fashions of the time included the following options: you could just wear your long hose and doublet, or you could wear trunk hose, canions, or breeches. **Doublets can be worn on their own or alongside a jerkin. The difference between these two garments lies with the sleeves: many doublets feature sleeves, while jerkins are usually sleeveless. Additionally, the jerkin is usually made out of leather, while the doublet is made out of fabric. Also worth noting: many of the men’s fashions from the era included the use of codpieces. While some of these may seem pretty easy to guess, you may be surprised by what you can grab to accessories your ensemble! Hats: very important during this time period. Belts: very practical, and can add a certain something to a skirt and bodice or doublet and long hose combinations. Capes: capes and coats like Spanish Surcoats and Dutch Coat were both en vogue at the time. Bags, purses, straw baskets, and pouches: to keep all your valuable in. Coif: kind of like a bonnet, but fits closer to the head. Can be worn by men and women. Jewelry: gold or silver tone, pearls, jewels, and beading. Great if you are dressing up as royalty! Gauntlets and bracers: perfect if you are portraying an archer or swordsman! Flag and paddle fans: For when you want to be cool. Partlet: worn for modestly and decoration by women. Can be heavily decorated, embroidered, and come in different colors (see below for acceptable colors). Gloves: great for swordsmen, or to go with more rugged ensembles. Ruffs: one of the most recognizable accessories, and worn by both men and women. The styles, colors, and decorative qualities of shoes varied for both men and women, but they all had similar quality throughout each design: round toes. 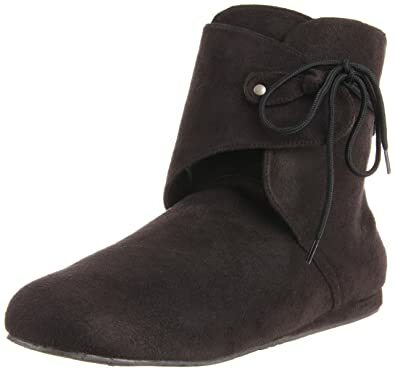 Flat or low heel Mary Jane-style shoes. They may also have a similar shape as a modern flat, but with lacing up the ankle. These shoes can be plain or incorporate decoration like stamping, slash & puff, or cutout details. Flat slip-ons or boots. Boots can be as low as ankle-length, or as high as above the knee. Snood: Netted head covering that kept the hair back, neat, and tidy. Mainly worn by women. Coif/biggins: Full head covering that could tie under the chin or at the back of the head, which concealed much of the hair. Could be worn by both men and women. Flat cap: A cross between a bonnet and beret with a small, floppy brim. Usually seen in heavier fabrics like wool, felt, or even velvet. Could be worn by both men and women. Muffin cap: Looks similar to a chef’s hat, but usually flopped to one side of the head. Tall hats: Hats resembling smaller top hats, but slightly tapered, and adorned with feathers. Varying styles could be worn by both men and women. Straw hats: Mainly worn by Lower Class individuals, these were handy while working outdoors. Note: the type of hat you wear indicates your social status. While there is much crossover between the styles for each class, some are worn more frequently by one versus the other. Shirts, chemises, and smocks: usually made out of cotton or linen (you could also use muslin). These pieces were worn daily, so they needed to be easy to clean. Outer garments: wool (predominantly used, even in summer), cotton, silk. Depending on how expensive the material is, you could get a way with using other materials like satin, sateen, dupioni, and homeware brocades. These items weren’t laundered nearly as often, so a nicer material can be used. Shoes, belts, lacing, hats etc. : leather. This can obviously substituted for vegan leather options. These pieces need to be durable, which is why they were made of leather. Across all social classes, natural colors like ivory/off-white, browns, grays, blues, and greens are widely accepted. Oranges and reds were also accepted, and black was okay as well, but not to be used predominantly unless you’re a Puritan. Purple was reserved for royalty, like the Queen. Gold and silver is also seen on the Upper and Middle Class, but more so on the Upper Class. Unacceptable colors include: neon/fluorescent colors, bright pink, and fuchsia. So you want to dress up, but you do not want to go all out necessarily. Totally cool! Wear what you feel comfortable in! This section is meant to give you an idea of how to build a Renaissance costume (non-fantasy) with 3 simple pieces, not including shoes and other accessories. You can also add a vest if so desired. Many of the principles and guidelines listed above can be used or manipulated for any character or persona you want to portray–whether it’s historically accurate or fantasy–I do want to make one point clear: wear whatever makes you feel comfortable and confident. Think about the climate you are walking around in, what you can afford, what you can make/repurpose, and what you already have around. Dressing up is all about the fun of it, ultimately, so make sure you have fun with what you are doing! Let me know what you though of this SUPER hefty guide! Did you find it helpful? What could I have added? Let’s nerd out in the comments below! And let me know if you’re going to your local Renaissance Faire! If you’re attending, make sure to check out my Ren Faire Survival Guide! Note: Images that are not mine were used solely for educational purposes.